Dispatched from and sold by Eshal24. 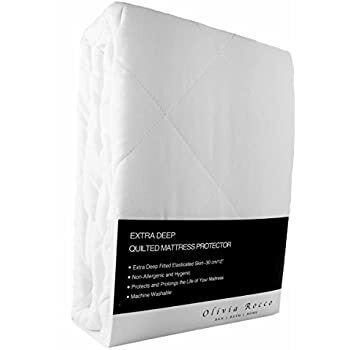 LUXURIOUS PROTECTION - Our breathable Hypoallergenic Luxury Quilted mattress Protector extra deep pad complete with soft poly fill that lets you sleep in dreamy comfort while keeping your mattress fresh and smooth. This is not with zip. 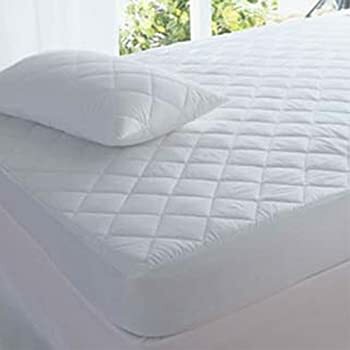 HYPOALLERGENIC -Our cool Luxury quilted mattress protector extra deep is down Alternative's unique properties which makes relaxation at its best. 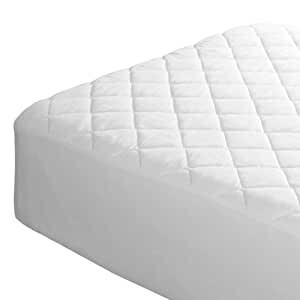 MATERIAL & COMFORT: Our hypoallergenic Quilted mattress protector will get you the best sleep, the material is made with polycotton, and it's breathable and noiseless. Easy care polycotton mattress cover Extends the life of mattress. 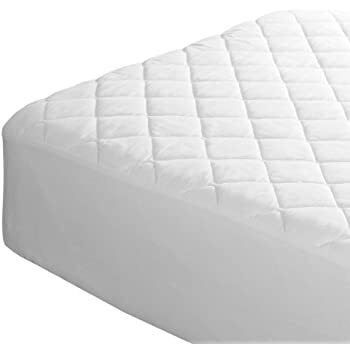 EASY CARE: Our quilted mattress protector extra deep is durable mattress pad which is conveniently machine washable at 40c, Tumble Dry Low, Remove quickly. Always follow care label instructions for best results. Sold by Eshal24 and sent from Amazon Fulfillment. Sold by HOMESCAPES and sent from Amazon Fulfillment. 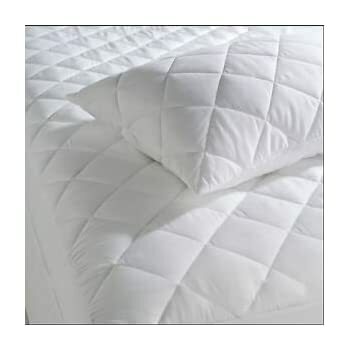 Our luxury extra deep polycotton quilted mattress protector means extra careful construction and durability you can trust. 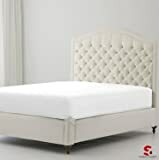 our mattress covers are fitted perfectly featuring extra deep skirt to accomodate more depth mattresses, Machine-Washable. It is available in single, double, small double,4foot,4ft,three quarter, king, super king and bunk bed sizes. 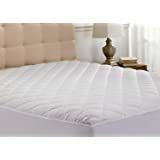 Our breathable Hypoallergenic Luxury Quilted mattress Protector extra deep pad complete with soft polyester Hypoallergenic fill that lets you sleep in dreamy comfort while keeping your mattress fresh and smooth. Our cool Luxury quilted mattress protector extra deep is made with hypoallergenic polyester filling which makes relaxation at its best. 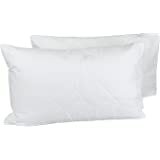 The hypoallergenic nature provides relief to those with allergies and asthma, and the supremely soft . Our hypoallergenic Quilted mattress protector will get you the best sleep, the material is made with polycotton, and it's breathable and noiseless. Easy care polycotton mattress cover Extends the life of mattress. This is a waterproof product which the description does not state. It fits nicely but is very noisy. nothing as luxurious as the picture! Very thin and see through when hand placed beneath it. 2.0 out of 5 starsMost disappointing. I wouldn't buy it again, it seems very cheaply made and wrinkles like it's made of paper. Really not wat was expected, it's really thin. It's ok. Quite flimsy but I probably should have paid a few extra pounds and got something which looked more like the picture. Was much thinner than I expected, and too small for our king size bed . More like double size.